Toenail onychomycosis is a very prevailing pathology (50% of the onycopathologies) with rather high rates of failure and relapse. Most of the cases originate from dermatophytes. The type of onychomycosis, the causative agent, and the factors dependant on the hosts are determining for the correct therapeutic approach of this pathology with rather high failure and relapse rates. Here, we analyse different treatment options focusing on the ideal pharmacologic approach according to current research of cost-effectiveness, pharmacoeconomics and safety. 2 Clinic Assistant . Departamento de Podología, Sevilla, Universidad de Sevilla, Edificio Docente de Fisioterapia y Podología, Calle Avicena s/n 41009- Sevilla, Spain. priscilatavara16@hotmail.com. Superficial dermatophytosis and onychomycosis (OM) are the two most common dermatologic diseases in the United States . The incidence of onychomycosis increases with age, and some studies suggest that up to 48% of the population may be affected by age 65 years . Toenail infection is several times more common than fingernail infection and is generally more difficult to treat because of the slow rate of toenail growth. A recent 12-center North American study found a prevalence of confirmed onychomycosis of 13.8% . The OM incidence may have increased dramatically in recent years as a result of such factors as the aging of the population, higher incidence of diabetes mellitus, greater use of immunosuppressive and antibiotic agents, increased exposure to infecting organisms, and the acquired immunodeficiency syndrome epidemic . Oral medications are associated with high recurrence rates and treatment failure, and are not suitable for many cases due to potential adverse effects. Topical medications are recommended only for mild to moderate cases. The cost of therapies may also be prohibitive in some cases. In the light of these issues, more research is warranted for the investigation and development of more effective and economical options for the treatment and prophylaxis of toenail onychomycosis. In patient populations such as diabetic individuals, where onychomycosis can provoke lower extremity complications, professional podiatric care of toenails and feet should be encouraged . OM has several clinical presentations; distal and lateral subungual onychomycosis (DLSO), proximal subungual (PSO), white superficial (WSO), total nail dystrophy (TDO), and candida onychomycosis (CO). the main causative agents, non-dermatophyte molds and yeasts are also not uncommon etiological agents of OM . Yeasts represent a last common cause of nail fungal infection in the world, and candida albicans and candida parapsilosis are the two most common species in immunosuppressed and diabetic patients . The microorganisms described here do not appear in healthy nails. The presence of those is associated with different predisposing or risk factors such as family history of OM and previous injury to the nails, as well as advanced age and compromised peripheral circulation or previous nail dystrophy. Patients with a compromised immune function, vascular or neurological systematic diseases, diabetes or psoriasis may have an increased risk for OM and are susceptible to infection with less common dermatophytes and nondermatophyte organisms . The clinical diagnosis of OM is not simple. Given the prevalence of the pathology, it is quite frequently misdiagnosed, especially when it affects nails in an isolated way. There is controversy regarding the necessity to use complimentary tests. A study about the cost-effectiveness carried out to analyse different tests for the OM diagnosis concluded that the execution of a microbiological culture or a direct test entails a long process or requires specialized equipment, as well as professional staff. The research also determined that obtaining a positive culture before the treatment with oral antifungal drugs is more cost-effective than just the treatment of all the patients with suspected OM without previous culture . In any case, the diagnosis must be based fundamentally in the physical examination and in an adequate anamnesis to determine the existence of base diseases (diabetes or other immunosuppression) or other factors of behavioural or occupational hygienic risk. Physical examination must also checking for injury, the reason of the consultation, the exploration of the skin and attached skin, looking for satellite injuries at a distance or the presence of tinea pedis or other dermatopathologies such as psoriasis. Onychomycotic nails may present with subungual hyperkeratosis, onycholysis, nail plate discoloration, and loss of consistency of the nail plate. Not all abnormal appearing nails are due to onychomycosis; in fact, only one half of all such nails may have mycologic evidence of disease. The differential diagnosis includes anatomic abnormalities of nail, for example, pincer nail, trauma, lichen planus, Darrier-White disease (keratosis follicularis), eczema, and psoriasis (Table 1). Paronychia may be due to Candida species or bacterial infection with the proximal nail fold being infected initially in most instances. There are different therapeutic approaches to the pathology that we will explain by focusing particularly in the pharmacologic treatment alternatives, which according to the existing evidence are much more effective. Mechanical nail debridement is achieved by nail clipping, filing, and abrasion with a dermabrader device, nail nippers, curettes, rasps, scalpels, and/or electronic rotary burrs. It must be executed on every clinical form of onychomycosis. In high-risk patients that cannot be treated with antifungal drugs (poly-medicated elderly patients, pregnant or breastfeeding women), the use of mechanical and/or chemical treatments (nail avulsion with urea at 40%) combined with antifungal medication can be useful with the consequent evident improvement of the pathology. Table 2 Association between the nail thickness and the mycological healing (Extracted from: The Journal of Foot & Ankle Surgery ). Table 3 Results of the treatment with antifungal lacquers. (Adapted from: Journal of Dermatologic Treatment ). The surgical removal of the nail must be assessed with caution due to post-operative complications, poor aesthetical and functional result, and risk of anomalous growth of the nail with the consequent risk of recurrence . Physical therapy includes photodynamic therapy (PDT) and laser therapy. Photodynamic therapy uses visible spectrum light to activate a topically applied photosensitizing agent, which generates reactive oxygen species that initiate apoptosis. Photodynamic therapy was originally optimized for actinic keratosis, but photosensitizers can also be absorbed by fungi. Existing clinical trials has shown that photodynamic therapy is safe, effective, and well tolerated; it promotes a favorable outcome with good patient adherence and may be considered as a practical and feasible treatment option for toenail OM . Laser therapy for OM is the most popular therapeutic option today. The capacity to concentrate energy with determinate wavelength in such a small area, make it the ideal treatment option given that it generates a structural and functional deterioration of the fungal cells provoking the end of the infectious activity . 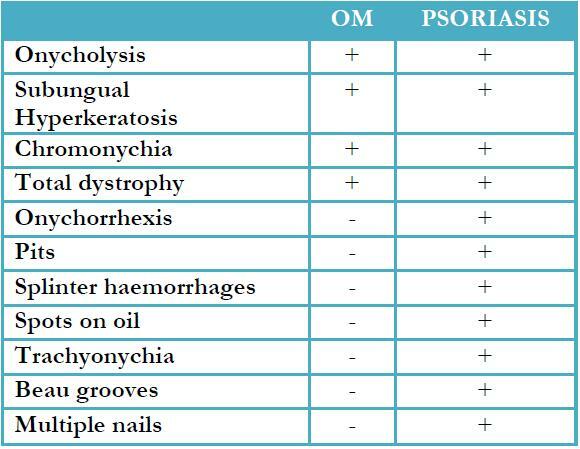 Table 4 Treatment of Onychomycosis with pulsate and continuous terbinafine. (Extracted from: Journal of the European Academy of Dermatology and Venereology ). However, currently there is a lack of data concerning the long-term efficacy of laser therapy of OM and certified treatment protocols are needed . In the treatment of OM, the criteria of strength and effectiveness of the antifungal medication used is very important. However, other aspects such the patient’s age, the clinical form, the extension and time of evolution of the infection, as well as the possible contraindications of the treatment are also important. The treatment depends, in certain measure, on the degree of acceptance of the assigned pattern and the way of administration. From the point of view of the infection, the problems derived from the structure of the nail are decisive, as well as the affected area, since both factors by themselves have influence in the effectiveness of the treatment. On the other side, the antifungal must remain in the nail plate in concentrations that are at least antifungal to guarantee the end of the fungal invasive activity. Topical monotherapy is indicated for SWO, and it is also a consideration when there is DSLO that affects less than 50% of the surface area without matrix involvement. Taking into account that the nail matrix is not affected by 74.6% of the OM cases, the number of patients that can use topical therapy is high. Topical treatment is indicated when few (ie, three or four) nails are infected and are also recommended for children with thin, fast-growing nails. It must always be considered first due to the small number of secondary effects . Among the different solutions, lacquer is the most used, since its application is more comfortable and it has a better fulfilment of the treatment. They are also more efficient because the active ingredient remains in contact with the nail longer facilitating its action. Ciclopirox is a hydroxypyridone with antifungal and antibacterial activity through its multiple mechanisms of action. The once-daily application of ciclopirox 8% nail lacquer for 48 weeks is recommended for OM toenails. The advantage of its use is that it has fungicidal activity with anti-inflammatory and anti-allergic properties. As a result of the complexity of its mechanism of action, the potential for the development of resistance to ciclopirox is low. The main inconvenience is that it has a different dosage depending of the period of treatment and the hydro-solubility of its recipients, creating confusion to the patient . Amorolfine is an antifungal agent of the morpholine class that is applied in lacquer at 5%. The advantages of its use are its fungistatic (inhibition of cell growth) and fungicidal (cell death) activities against dermatophytes, non-dermatophytes, molds, and yeasts. Tolerable application side effects such as burning, itching, redness, irritation, and pain are associated with amorolfine use. The drawback is the long duration of the treatment with the risk of neglecting the therapy . Tioconazole is a substituted imidazole and it is used in concentrations of 28%. It has antimicrobial and antifungal properties, and has a broad spectrum of activity in vitro against dermatophytes and yeasts, however the cure rate of the treatment with tioconazole nail solution is only 22% . Oral systemic antifungal treatments are generally more effective than topical treatments; however, they are also associated with higher risks of adverse events and drug–drug interactions. Oral therapy is recommended when at least 50% of the nail plate surface is affected (with or without involvement of the nail matrix), or multiple nails are involved, as well as for patients whose conditions have not responded after 6 months of topical therapy . Nowadays, oral terbinafine and itraconazole are standard OM treatments. Itraconazole is a triazole that has antifungal activity against dermatophytes, yeasts, and other fungal infections. Terbinafine is an allylamine that penetrates the nail through the nail matrix and the nail bed and is actually the most potent antifungal agent in vitro against dermatophytes . It is strongly lipophilic and is distributed well in the skin, fat, and nails. The main advantage is that it has been shown to be more effective than the antifungal azoles for dermatophyte OM. The main disadvantage is that it is not as effective as itraconazole for the treatment of candida OM . Regarding the safety of terbinafine and itracozanole by oral intake, the adverse effects associated with the use of those antifungal agents are usually mild, transitory and reversible after discontinuing the treatment. In the analysed research two types of risks are mentioned. The first one mentions the risk of interrupting the treatment due to liver injury or toxicity that generally is quite low and even lower with the use of terbinafine associated with a better safety profile. The second one is the risk of presenting adverse reactions, which varies around 5-10%, the most frequent being linked to the gastrointestinal and nervous systems, liver, and skin . Combination therapy is one way of improving the speed of recovery and the overall cure rate of OM. Although monotherapy has proven effective in the short term, a substantial proportion of patients do not experience a complete and lasting cure. Treatment strategies include topical and systemic antifungal therapies, and surgical and chemical nail avulsion. The use of combination strategies and the exploitation of antifungal drug synergy is a well-established principle in mycology. The combination of two or more drugs can result in increased efficacy and rapidity of effects, a broader spectrum of activity and better patient tolerability. These benefits can often be the result of drug synergy, that is, the combination is more effective than the additive effects of each drug alone. The current strategy for combination therapy involves combining oral and topical antifungal agents. The different modes of drug administration allow for complementary drug penetration into areas of infected tissue where each drug alone does not accumulate in effective concentrations; oral drugs rapidly suffuse and accumulate in the nail bed, while topical therapies effectively penetrate the nail plate and may be effective in preventing reinfection of the nail itself [17-19]. The inadmissible rate of therapeutic failure of OM with the pharmacologic treatment is due in many cases to a clinic misdiagnosis and in others to the patients failing to follow the treatment, particularly in the case of topic therapy. We have considered an opportunity to make an analysis of the cost-effectiveness and safety from the existing evidence, which serves as reference when indicating a treatment in patients with OM with the aim to increase the success of the pharmacological treatment. Therefore, we have carried out the revision of several studies that compare two or more therapeutic alternatives for the clinical and mycological resolution of the OM. The first study with a level of evidence Ib (at least a random clinical trial) establishes that in all the clinical forms of OM, a nail debridement through milling must be done, with the aim to reduce the thickness of the nail, remove the infected surface, and allow the penetration of the medicine through the nail plate. The results of this study prove the inverse proportionality of mycological healing with the lower thickness of the nail (Table 2). On the other hand, the study concludes that in the cases where mechanical debridement was accompanied by the local application of antifungal lacquer (Ciclopirox 8%) the mycological healing rate was higher (76.74% in 10.5 months of treatment) . Regarding the topical treatments with ciclopirox, amorolfine and tioconazole, a second study with a level of evidence IIa (at least a well-designed non-random and controlled prospective research), made a comparison between the different antifungal lacquers commercialized in Europe (France, UK, Germany, Italy and Spain) incorporating also the alternative to not treat, with the aim to determine which one of them is more cost-effective for the treatment of OM. The results proved that the use of ciclopirox 8% once a day during 6 months is the treatment with better cost-effectiveness  (Table 3). 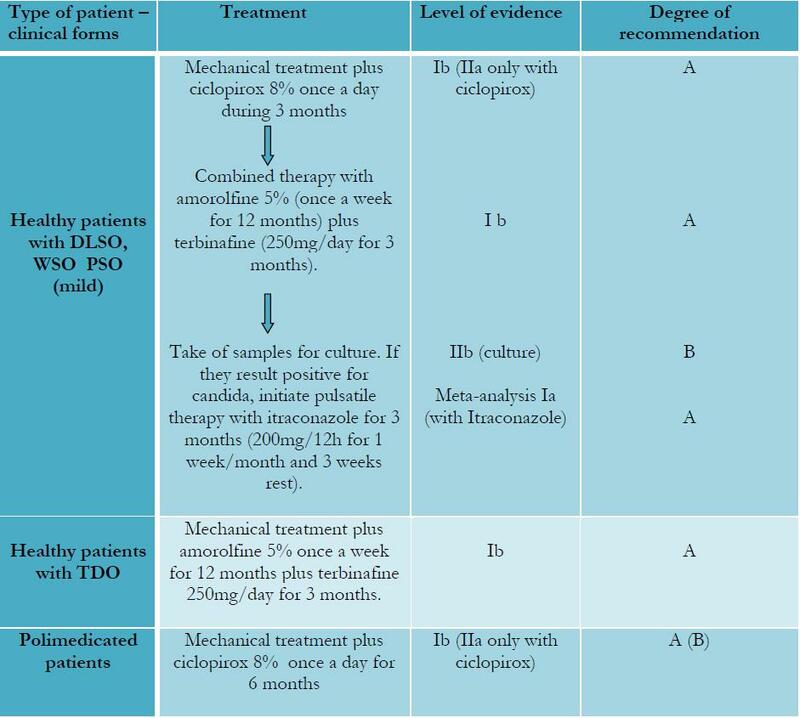 Regarding the oral treatments, a third study with level of evidence IIa compared both alternatives of dosage presented by amorolfine 5%, given that the technical specifications allow one or two applications per week. The results indicated that the application once a week is more cost-effective, because it favors the fulfilment of the therapeutic treatment . A fourth study (meta-analysis-evidence Ia) checked the complete mycological healing of OM compared to the use of terbinafine with itraconazole used in both continuous and pulsatile therapy. Such study established that the most effective treatment was the terbinafine continuous treatment with a dose of 250mg/day PO for three months, given that it presented a more prolonged effect in time provoking a higher rate of mycological healing with 13% more success (table 4). On the other side, the pulsatile therapy with terbinafine 250mg/12 hours one week a month during 3 months, presented an excellent cost-effectiveness relation, but it was associated with lower rates of complete healing. This same study also executed an analysis of mycological healing through the use of different pharmacologic alternatives by PO for the treatment of OM, concluding that terbinafine taken continuously, is much more effective (76% healing) compared to itraconazole taken continuously (59%) and pulsatile intake of terbinafine (63%), fluconozole (48%) and griseofulvin (60%) . A fifth multi-center study (evidence level Ib) checked the action of mono-therapy of terbinafine PO 250mg once a day during 3 months in comparison to the combined therapy of amorolfine in nail lacquer 5% once a week during 12 months and terbinafine PO 250mg/day. The obtained results showed that the synergic action of the combined treatment presented a higher rate of success (59.2% in the combined therapy and 45% in the mono-therapy) and the treated patients had more probability to be clinically cured after 18 months (66.7% in combined therapy against a 53.5% in mono-therapy). The decrease of the percentage in affectation of the nail was of 85.1% (78.5% in mono-therapy) after 18 months of treatment. 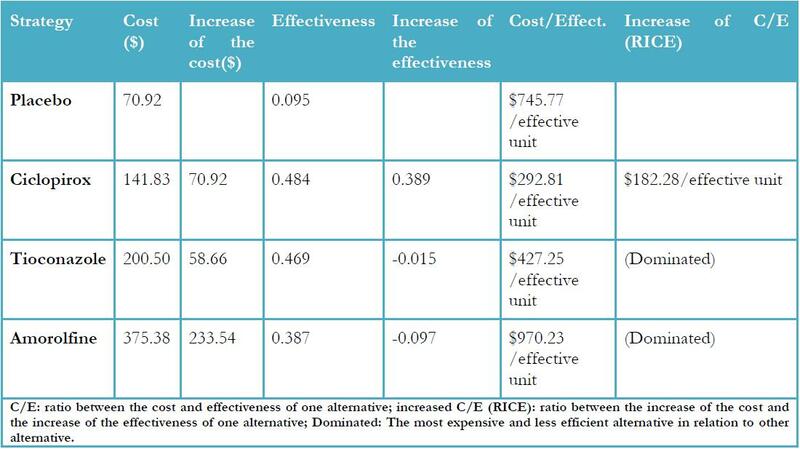 The cost-effectiveness analysis indicates that the total costs were higher for the combined treatment, and due to the efficiency significantly higher for the combined therapy during the same period of time, the costs per patient can be considered inferior in the treatment of amorolfine-terbinafine in all the studied countries . Based on existing evidence and in function of the characteristics of each patient and the clinical presentation of OM, we propose in Table 5 and as a summary, the different options of treatment related with the level of scientific evidence of each one of them. It is important to remember that there is a high level of evidence (Ib with recommendation degree A) that proves that the debridement of the nail plate combined with periodic visits to the podiatrist every 2-3 months increases the rate of therapeutic success of OM on toenails. Pibernat MR, Garcia CI, Carretero LF, et al. Better cost-effectiveness of amorolfine nail lacquer 5% once weekly application vs twice weekly application in the treatment of mild and moderate onychomycosis. Piel. 2006 21(8): 378-85. This entry was posted in Uncategorized and tagged antifungal, onychomycosis, pharmacoeconomics, therapeutic. Bookmark the permalink.